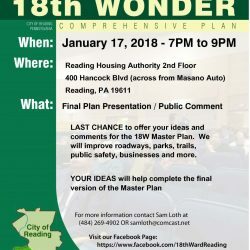 Reading: The 18th Wonder Improvement Association has announced that a third and final Public Meeting for the Millmont, Oakbrook and Wyomissing Park neighborhoods will be held on Wednesday, January 17th beginning at 7:00 PM at the Reading Housing Authority, 400 Hancock Boulevard, Reading (Across from the new Masano Auto Complex). The 18th Wonder Improvement Association (18W) is a Nonprofit Community Development Corporation formed to take the assets of the three neighborhoods that make up the city’s 18th Ward and improve the quality of residential and commercial life. A Master Plan is being finalized through a $55,000 state grant awarded to the Berks County Community Foundation. The 18W has been working closely with its consultant, Simone Collins Design Group of Norristown gathering public input for the Plan. Simone Collins has been tasked with writing the Master Plan based on their scope of work research, comments from the three Public Meetings, face-to-face interviews with residents, businessmen and community leaders and the results of an online survey and other input into the Master Plan. “We want to take a great community and make it better,” Peter Simone told the audience at the start of meeting #1. This third public meeting on January 17th will build on data that has been gathered resulting in the Final Draft Master Plan. The plan will include recommendations for trails, parks, green space, pedestrian and bicycle improvements, commercial corridors and stormwater improvements. While the consultants continue to work on the Master Plan, the 18W in cooperation with Alvernia University’s ‘Leadership Berks Program’ is mid-way in completing a 5-Year Strategic Business Development Plan to focus on other redevelopment issues. These include components like organizing the businesses along Lancaster Avenue, Morgantown Road and New Holland Road and figuring out what types of new businesses the community would like to see. The Leadership Berks Team of professionals will have a final version of the Business Plan in May. The Plan will stand alongside the Public Master Plan. “By developing two plans side by side, we will have the overall blueprint to make incremental improvements over time,” said Sam Loth, 18W Coordinator. “Once both plans are completed the 18W will begin pursuing various grants and other funding streams to initiate the projects identified in the plans.” he said.